Grammy-award-winning artist Zac Brown dreamed of building a treehouse for campers at his Camp Southern Ground in Fayetteville, Georgia. When Pete heard of Zac's treehouse dreams and learned of Camp Southern Ground's mission to serve children of all abilities, he was ecstatic! Working on this futuristic, multi-purpose treehouse was one of the highlights of the year for Nelson Treehouse and Supply. Because Zac wanted the treehouse to have a building life of 100+ years, Pete knew the design would have to incorporate metal in order to maximize sturdiness. The unique shape of the treehouse was inspired by the position of the surrounding trees; the groves created an elliptical shape that reminded Pete of a horseshoe crab. When sheathed in zinc metal sheeting, the treehouse looks like a futuristic crustacean. Zac and Pete loved the idea of the Space Crab treehouse as it fuses the alien with the natural to create a structure that's out of this world! To increase the longevity of the structure, Pete used beefy steel posts and beams in place of trees as the main supports for the 16-foot-high hull. The 200-foot ramp is supported by a combination of sweet gum trees, oaks, maples, and metal posts. Pete selected zinc as exterior sheathing because he loves that the corrosion-resistant material is also recyclable. Thanks to the use of metal supports, the massive Space Crab can hold up to 150 people and carry over 187,000 pounds! Over-sized windows and doors provide sweeping views of the surrounding forest. A long "tail" extends from the deck of the structure, mimicking the shape of a horseshoe crab. The long ramp to the Space Crab is wheelchair accessible. With plenty of roomy platforms along the way, campers can stop to spot wildlife and soak in views of the forest. Clad in composite decking, the ramp will last for years to come. Composite is a long-lasting, eco-friendly decking material comprised of wood and recycled plastic particles. It's also hassle-free, as it removes the need for annual refinishing. 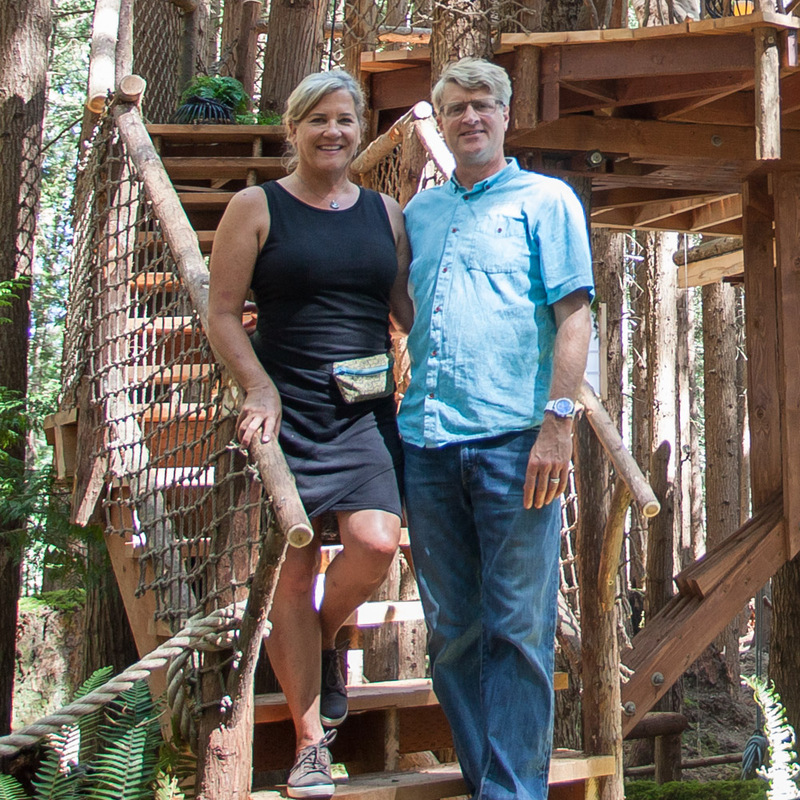 The interior of the treehouse is multi-functional: the space can be cleared for games and activities or filled with a retractable table for group discussion. Large TV screens display educational videos, and plenty of fun, squishy seating makes the treehouse a camper's paradise! Pete collaborated with Zac Brown Customs to create this stunning table. With the push of a button, the table descends from the ceiling. When it's time to clear the space, the table retracts back into its lofty nook. Zac Brown Customs used parota wood for this one-of-a-kind table. Pete was in awe of the incredibly talented craftspeople and modern workshop at Zac Brown Customs! It makes you feel like you're not anywhere else that you've been before, which makes you believe that you can be something that you've never been before. We're in complete agreement: being in the trees can be a remarkably inspiring and empowering experience. We are overjoyed that generations of campers will be able to dream, play, and learn in Zac's Space Crab. Thank you for a magical build, Zac and Camp Southern Ground! And thank you to the many collaborators, subcontractors, and vendors who made the Space Crab come to life!